Depression is defined as a mental state characterized by a pessimistic sense of inadequacy and lack of activity . It involves the inability to concentrate, insomnia, loss of appetite, feelings of extreme sadness, guilt , helplessness and hopelessness. Depression is caused by many factors. Depression can be caused by physical problems and even a chronic illness. Also by life events such as the death of a loved one, a divorce, lost of a job and traumas. Depression prevents you from enjoying and living your life with happiness and joy. It lowers your self esteem and sense of self worth. Your life become a mess, you make excuses to alienate yourself from others. You might be think about Suicide because you feel hop less and alone. Depression affects the way you think lowering your moods. If you being going through depression for a long time I would suggest to consult a mental health professional. 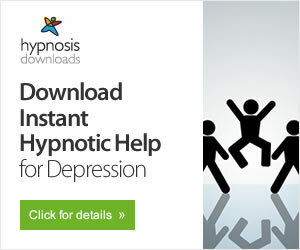 You can try Depression Treatment or Coming out of depression self-hypnosis downloads. Read about Self-hypnosis Techniques and how can they improve your life. Involve with friends and family. Another symptom of depression is wi throwing from people. Go to a movie, go out with friends , this will help to fade the isolation feelings of depression. Take responsibility and work inside yourself. When you are depressed you believe that you can't cope , you become negative and self-critical. Work on your self esteem , meditate, practice a positive attitude. Depression is an opportunity to heal an attitude about yourself. Depression can tells a lot about dissatisfaction with ourselves. Healing depression is an opportunity to find yourself and real meaning in life.